Life is lived in seasons. In this present season, I sometimes question how to homestead alone and not die in the process. Right now, I’m wedged between seasons….we’re at the tail end of raising a large brood of children, 9 to be exact. We have two at home, 8th grade and 10th grade, both of whom are excellent student/athletes. Some of the other kids are grown and out of the house, some are still in college, etc. Some days I feel like something close to an empty-nester, but then again, most of time I’m so not. I’m very involved in the children’s lives and I’m glad to be. I want to finish this season well. Yet, just over the horizon, I see the next season coming. The season where it will just be my husband and I, all alone on this 10 acre farm. Just a few short years ago, we had a small army to help out around here. Having a strong work ethic has always been important to us as parents, and to make sure our children understand what a “hard days work” looks like. Over the years, they have learned much about how to raise and preserve food and animals. Some of them enjoyed the process more than others, and that’s ok. It’s the knowledge I wanted them to leave home with, what they do with it is up to them. Nonetheless, I am managing the farm most days by myself, while my husband runs another business. My man is good enough to help me on weekends here and there, and for special projects, but to be honest, this homesteading thing really isn’t his deal. He loves each and every animal we have, but at the end of the day, he would be content to go the grocery for food. Just being honest, I’m sure there are some of you who have the same situation. It’s alright, I came into this with that understanding. This homestead is my baby. That said, I am pretty much on my own these days. Again, my husband helps on weekends when he can, but it’s primarily on me. Now, let me clarify. We do not make our living on this farm. This farm was set up for several reasons: to gain agricultural tax status by raising animals, to raise our children on a farm and to raise our own food. The farm lowers our need for outside purchases and every year we become more self-sustaining. We hope to enter retirement (no time soon) with minimal utility bills and abundant food sources all around us, through a great deal of planning and permaculture. There are times when I feel as though I just don’t have the endless energy that I once had, even just 5 years ago. At 55, I have to pace myself to get everything I want to get done in a day. Yet, in the spring and summer, which is “high gear” time on a homestead, there are many things that I just can’t get to by myself. Gardens get overgrown quickly, stalls aren’t as clean as I would like and soon, I feel overwhelmed and defeated. Not a good way to live. This was supposed to be fun. After a couple years of thinking about this, I plan to make some changes this year. No, I’m not selling the farm to go live on the beach in a condo, like lots of our friends! I’m going to work smarter, not harder. When we moved here, most of the property was raw land. There was a house and a small pole barn. We added a horse barn, goat barn, three chicken coops, 5 acres of pasture fencing and ran electric and water to all of it. No small feat, and it took us a number of years to do all of that. We also added 2 orchards, 2 large gardens, grape arbor, mushroom patch and numerous other native trees and plants. The last couple of years, I’ve zeroed in closer to the house with planting. Most of the fruit trees are close to the house, so that we won’t have to walk as far when we’re older. The “kitchen garden” is close to the house as well, near by the clothesline. This is all pretty manageable. Where I work myself silly is cleaning up after animals. Animals poop. I’ll bet yours do as well. Since that can’t be helped, it’s up to me to shore up the places where the animals poop. This is mostly a winter problem, but cleaning out that many buildings is hard on anyone’s body when you’re doing it all by yourself. This year, I am considering bringing all the chickens into the main horse barn, by building roosts and nesting boxes right above the horse stalls, so that all of their dropping will fall right on top of the equine droppings. One stop cleaning! I’ll save the coops for breeding, as I raise Black Copper Marans, and for raising meat birds, both of which are seasonal. My father told me that when he was on growing up on a farm, all of the animals lived in one barn…period. There were no special coops for chickens or separate barns for goats, etc. There was ONE single barn and all the animals lived there. Makes sense. This was a game changer last year for me. I love chickens, like I realllllly love my chickens. When you love chickens, you tend to buy more chickens than you need. So, I made a business out of it, selling my organic, free-range eggs for $4 a dozen. I got to the point that I was delivering over 60 dozen eggs a month. That’s insane. Feeding that many chickens, about 60, isn’t cheap when the cold weather arrives. My girls are all free-range and so they eat primarily nuts, berries and insects (plus some feed), but in the winter when there’s nothing to forage, feed can cost you an arm and a leg!! AND they don’t lay much during these months! Earning $4 per dozen doesn’t make any profit whatsoever, it just pays for the feed a little gas and labor, as most of my customers wanted their eggs washed. I really loved serving my customers with fresh, gorgeous eggs, but at the end of the day, I was just running around in circles. It would make more sense to sell/cull most of my birds and get down to a very reasonable number, like 15, and just feed us. It may seem somewhat selfish, but at the same time, I have to take care of us…and me. When egg prices dropped last summer, I was so glad I wasn’t selling eggs anymore, trying to substantiate my price. I don’t care what Walmart sells eggs for, that’s not what it costs ME. It’s completely “apples and oranges” and they can’t be compared. The same is true with my honey bees. Beekeeping isn’t easy and it isn’t cheap. Once again, honey prices (or so-called honey) dropped last year. I just won’t give my honey away, and reduced my bee hives by half so that I could manage them and still enjoy the process. The honey is mostly for us and a few friends. The two big gardens are being re-structured this summer. I don’t want to give up that gorgeous top soil and just stop planting, I’ll worked too hard to amend it over the years. However, I don’t need to grow as much food as I have been. When you’re growing enough food for yourself, your neighbors, the senior complex and then giving still more to the food bank, you are growing too much food! I’m going to reduce my food production significantly this year and try my hand at growing some landscaping plants, to sell for profit. If I don’t like that, I might fill that area in with wild flowers. Either way, I can’t process and/or deal with that much food anymore, and it’s not even realistic anymore. You might need to move and downsize your property holdings. I can’t imagine moving at this point in my life, everything about this property is right where I want it to be at this time. But for others, you might do well to relocate and continue the homestead dream. The right equipment is so important, you can’t do everything by hand, especially as a middle-aged woman. We own a used John Deere front-loader and it’s does everything I need it to do. Remember, the more equipment you own, the more it owns you! There’s maintenance on everything you own, so buy good quality and take care of it! Invest in good quality tools that are easy on your joints and back, including a 2-tire wheelbarrow and a large easy to pull wagon. These tools will go a long way to keep your pain down. My goals today are different than they were 10 years ago, but honing in on exactly what my goals are this year is taking me some time to think about. This is why winter is so important to me, I need the time to think and pray after the holidays are all over, and ask myself some serious questions. What am I trying to accomplish this year? What things are becoming un-enjoyable to me now? How can I lessen the stress on my body while still achieving my homestead goals? Next up, “How to Homestead ALONE 2 – The Journey Continues“! I would love to hear about your experiences with changing seasons and goal-setting! I managed our small farm for the last 4 years before selling, it took and gave so much to my life. My husband and I are now establishing tiny homesteads on small acreage and I have to tell it’s more work than the farm… But we love it. That last 4 years on the farm was hard at times and I agree consolidating makes a lot of sense. It’s easy to become an animal hoarder thinking more is better but that’s just not always true. We used rotational grazing and that was the game changer because the pastures recovered naturally. This left me more time to do other things. I only cleaned up droppings when I needed them for the garden because the rest were fertilizing the fields. Letting nature work for you is the key…. To many times we establish things in a way that requires our full attention which in the end drains our passion and energy. But I agree, I’m not selling out for a condo and beach life either. I’m looking forward to finishing this project we’re on right now so we can get back to raising a few animals with addition to hunting because I discovered deer meat this winter and it’s amazing. Thanks Carole! I enjoyed reading your comments, so true! Hunting is something I want to do as well, venison is wonderful! We have some things in common, Kelly. I’m the same age as you, but my husband is older and nearing retirement. He is in poor health. We live most of the time on an acre in New Mexico, where we both have full time jobs. We go to our 23 acre farm in Kansas about 5 times a year. Each time we go, I think about how I want it to be when we retire there…animals, large garden, the old farmhouse needs so much work! I do a garden and raise chickens and turkeys in New Mexico, so I see somewhat what I’m getting into. But I also see not to bite off too much, either, because I know I’ll be doing those things by myself. Our five kids are grown, but we do raise 12 year old twin grandkids, so they are helpful. Right now our solution is a cousin farms our land and keeps an eye on the farmhouse, and keeps the grass mowed and the place presentable. That’s how we make it work. But I can’t wait till we retire and move!! A few more years I think. Wow, we do have a lot in common! My husband is 7 years older than I am, but in good health. The 12 year old twins would be helpful, that’s a good age. Sounds like you’ve got a great plan going! Thanks for the comment! I really enjoyed this post! You have some great ideas. I will be 65 this year and my husband will be 70.He still works in the Cardiac Cath Lab at a hospital that is a 50 min drive. He works 10 hr days and when he is on call he can be gone 4 days at a time. We have 20 acres with all the work that entails. We also do foster for children ages birth to 5. We have an 8 yr old who was one of our foster children that we adopted. All 6 adult children live in different states. Most days I feel like I’m just treading water to keep up! It’s good to know that others are dealing with some of the same things and get ideas. Hi Pat, sounds like we’re doing the same dance for sure!! What a beautiful atmosphere for your foster children and adopted one! Best to you and yours and thanks for your comment! Hi Pat I so want to foster on a small homestead! I’m single now and also 65 glad to hear it’s done and yes great healthy lifestyle for the foster kids, any advice? Hi Karole! Farm chores and working with animals has been shown to help children with emotional/mental set-backs by encouraging problem-solving skills. I would keep a chore chart and make sure everyone not only does their (age appropriate) chores, but continues to learn new skills. We keep a couple of horses and miniature donkeys, which are very good for the children to learn to ride. The “rocking” motion of the hips while riding stimulate parts of the brain that help heal emotional abuse, you can google it. Fostering is a lofty endevour, but homesteading with them will be the best home life for them ,I’m sure! Hi. I am a single 64 year old woman on 5 acres. I used to have cows, but had to sell because they were eating better than I was. I still have plans for a garden, chickens and cows again all for self-sufficiency. I know it will be a lot of work, but being self sufficient is important for me, and to be able to give this acreage to my daughters when I leave. Reading articles like this is going to be very helpful when I am able to begin setting up again. I hope to have chickens for eggs and meat this coming year. I will need help with the garden, getting it started as I never gardened before. (my parents came from huge gardening families and the store was enough for them after decades of gardening, so they never taught me. )…;-( Cows will come later after I have established the other livestock. I have experience with cows, and goats scare me as they are problematic….goats would be better as they are smaller, but I don’t know them, so cows it is. Maybe sheep for wool and meat…we’ll see. Thanks for the article. I know I’m taking on a lot of work, but work never scared me. Hi Carol! That’s awesome, thanks for sharing your story! Take it one day at a time! I loved this article too! And like you, I am 64 and single! Thankfully, I bought 10 acres of land in between 2 small towns BEFORE I lost everything in the 2008 crash! So I will be reading and learning everything I can. And it’s so nice to know that there is someone else out there doing this alone. By the way…I LOVE being alone! Hi Kathleen! Thanks so much for sharing a little about yourself and for your comment!! Thanh YOU! I’ve never come across anyone writing about doing this alone! Thanks for sharing. Being 25 years your junior with a house full of little children, this is good to hear. We are still planning and building and growing, but I have been giving a lot of thought to what we will do down the road. Right now, I essentially homestead alone. Our children are just first really going to be of help to me this year, and my husband also works a job away from home.. figuring how much to grow and what long-term goals are is tricky! Hi Danielle and thanks for your comment! I encourage you to train your children to be truly useful on the farm, because those years of learning only last for a season. Best to you! I stumbled across your post while staying up late looking at goats on Pinterest… (blushes). What a great post! I’m in a different season, with 6 small children ages 8 and under (three of whom are 2 and under because moving to the country agreed with my fertility.. HA!). My husband can only help on the weekends and I’m left with our dream “farm” trying to care for the gardens, bees, goats, and chickens on my own. No one could have prepared us for the amount of work it would take just to keep things status quo around here, let alone make improvements! Thank you for this article. I found it helpful and full of great advice a well as an encouragement to any woman giving this self-sustainable lifestyle a shot. Hi Steph! Thanks for your comment! I remember those days with 9 kids running around and trying to homeschool. Sometimes I wonder how I did all of it. There are no easy answers to all of this when the “homestead bug” hits you other than to just do the best you can and don’t overload yourself. You’re simply not going to get it all done, but try to enjoy the journey! Hi Susan, I’m just fine and right here at gentlysustainable.com! Are you referring to the Simple Homestead Blog Hop? That takes place Thursday and you’ll see me there! Thanks for checking on me!! Your title grabbed me today. I do very little that I consider homesteading. I have chickens and I try to garden, which I’m not very good at. I’d like to do more in the future, but I seem to be better at dreaming than actually doing. I am alone as my husband and I have been separated for over a year. I have no one else, just my pets. Before I married I was quite capable of doing whatever I needed to do, but after several years of having someone to carry most of the load, sometimes the thought of doing things alone intimidates me. Thank you for the reminder that there are women alone who take care of business just fine. Hi Susan, I’m laughing about the horses! There’s no perfect system! They’re just going to have to duck! Thanks for the comment! I love this post! I do feel like I’m homesteading along to some extent. I have 6 kids ranging from 2-11. Some of them are helpful, some of them add work. I figure I break even. 🙂 My husband shares the dream, but his full time job and house renovations leave most of the “farm” work to me. He does help when I need it, but whenever he is outside with me, the house isn’t getting finished. 🙂 I appreciate your ideas! Hi Babychaser! Thanks for sharing your story, hang in there and keep up the good work! How awesome! 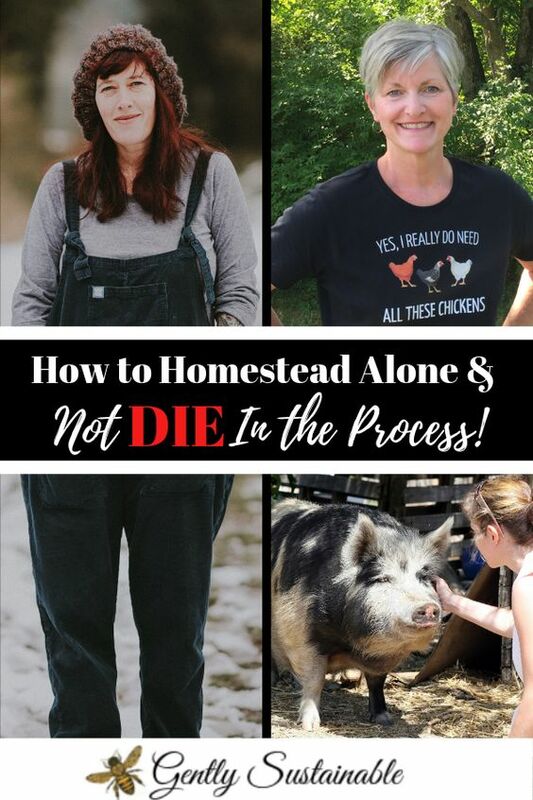 I just hopped by from Homestead Blog Hop to check out your homesteading alone post and I shared your wonderful story. Such useful and inspiring ideas. Hi Deborah, Thanks for stopping by and for commenting! Hope to see you again! I really enjoyed reading this as I found it helpful in aiding my new adventure. My husband and 9 year old daughter and I are moving to our 33 acre country estate in a couple of months. We live in town now and are used to the amenities but are wanting to try our hand out at pioneering. I grew up in the country and was around animals but it’s been a long time. My husband works in the oil field and is gone most of the time, so this adventure will be mine to maintain. But I’m 39 and if I’m going to do it, now’s my chance! Thank you for all the practical no nonsense advise! Hi Amanda! Doing your research and going into a new season with eyes wide open is the best advice I can give. You can do it! Good luck! I read a lot of blogs but never comment! I am turning 50 next month and am looking forward to selling the big house and going small and basically off-grid in the next year. My husband and I have had small acreage, chickens, and horses (which I am now afraid to ride because I am the only one with a paid job or two. I cannot get injured!) for 12 years. Your article really spoke to me because I am getting older and am worried about starting something all over again at my age. Very inspiring! While my husband helps and has agreed to go along for the ride, I am the one who starts projects, fixes things, cans the harvest, and does most of the home maintenance. He enjoys mowing and landscaping and is the main cook and laundry exec in the house, but not really as interested in self suffiency. I dream of larger acreage that we can retire to once our last of 4 kids flies the coop in a few years. We must make it easier, as the kids won’t be around forever to help and they really make our lives easier now! Permaculture and keeping everything closer to the house makes great sense. Your topic really makes me appreciate all that my husband is able (if not always willing) to do! I can’t imagine doing it alone and you deserve an award for continuing to make it happen for you! Hey Cindy! I am so excited for the journey ahead of you! Sounds like you’ve got some great plans! Thanks so much for taking a minute to comment! Hi Kelly. Loved your article and identified with most all of it…I too am a single homesteader from SW Ohio. I am 61, have an 80 acre farm, which I cash rent. I try to grow as much of my food as I can and raise chickens and honeybees. I think a lot about how to “age gracefully” on this farm..I have been here 30 years and doing it alone for 18 years and it’s not getting any easier as the years pass. I constantly think about ways to simplify things and appreciate that you have some of the same thoughts. Sometimes I wonder why I continue to do all of this hard work and then I realize that it defines me and deep down I still love it. Just hope my body holds up…I probably will continue homesteading and die in the process, but with a smile in my heart! Thanks for your article and keep plowing ahead! WOW what an eye opener, I too am older now an making the home steading changes. Worked many years out side the home raising children my husband a good guy but not really into it. He worked hard also out side the home to help pay the bills. We always had a garden put up our owe food, burn wood for heat, cooking in the winter. I enjoyed reading all the replies on your post smart women. It can be frustrating not to do the things we were once able to in half the time and not being in the best of health. But as strong women we fined a way to do things smarter and better to enrich are lives and love our family. Hi Elizabeth! Well said! Thanks for commenting! Oh, my goodness! I could have written your post! After 27 years as a banker I retired and started my lifelong dream of having a small farm. That was about 7 years ago and each year I’ve added to the load. I now stand at 1 jersey milk cow (who as I write this is getting ready to calve out in her shelter), 2 Lamancha milk goats due to kid in June. 31 hens, 2 pigs (short term project…yeah!) a horse I feel guilty about not riding more and 2 worthless dogs who bring incredible joy to my life. My husband still works and he, like your husband loves the animals but mine would rather golf than fix fence. So it’s mainly up to me. This year my goal is to learn how to use power tools. 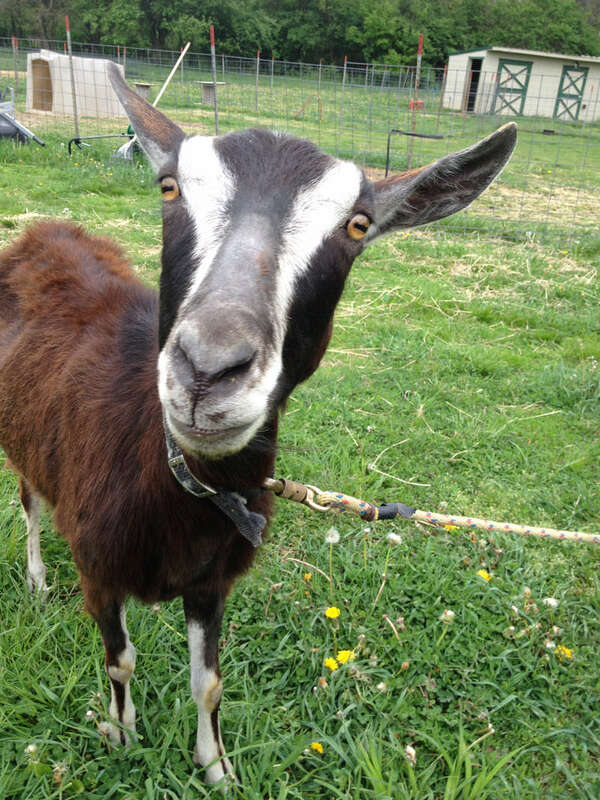 My husband is in the construction trade and has built our house,barns,shelters,shed, chicken coops, etc….I can’t bear to ask him to build me another thing so I want to learn how to build my next goat shelter(for the new kids) myself. Your post was very encouraging to me as I too need to downsize my operation. I do a farmers market all summer to help move milk, eggs etc but am thinking I need to start focusing on providing for just us….not the whole neighborhood! Not sure what that’s going to look like but a good start would be to reduce my chicken flock to maybe 10 hens… if I can bear to part with them. Love my farm but wish I could have started when I was about 20 years younger. At 65 I feel the pain…! Hi Shannon! Thank you soooo much for sharing your story! I, too, want to be better at carpentry! We can do whatever we want, but we can’t do it all…at least at the same time. Good luck with your future decisions! Found your post going through my nightly Pinterest . I have categories galore to go along with my self Dx ADHD for starting our homestead on 10 acres an hour outside of Dallas, Tx. It’s rare that I can focus long enough to read a total post etc because I save it “for later” I am inspired! I will be 50 in July and my husband 54. We both grew up on small farms but went on with life, raised 2 kids outside of Philadelphia on an acre. We have struggled last 5 years . Just when we thought we could plan our move South , kids graduated college, my mother had a life changing stroke in 2013 that took her from an independent , living on her own in Northern Maine out in middle of nowhere , to a total dependent, bed bound , wheelchair bound w right side paralysis victim of fate , she came to live w us and I became her 24/7 caregiver. She still had her mind. I had to quit my job as a nurse LPN and become HER nurse. With that said my mother was so excited to make move to our 10 acres in Texas w us, she planned to get a dog, Great Dane, an Alpaca named Dottie May (after her ) and build a tree house, even though she wasn’t quite sure how I was going to get her up there in her wheelchair! She woke up everyday waiting for us to make our move. She talked about the chickens, goats, horse or 2 and garden w honey bees. We just didn’t get there in time, my moms health slipped and she passed suddenly in Oct 2017. Your article makes me see that we CAN do this but also gave me a realistic goals not to go overboard and bitting of more then we can handle. We have to be careful to plan , make good decisions so we can enjoy our homesteading without putting us back in hardship. Looking forward to following your articles and learn from you and your readers to make this our dream and (my mother’s dream ) of returning to a small farm and having an enjoyable but rewarding dream to homestead. Julie, First let me say how sorry I am about the loss of your sweet mother. What an incredible story! Thank you so much for sharing your journey! Best of luck to you and your homesteading dreams! I live in my camper tying to save for our homestead dream. We have really learned a lot about living simple, but I miss my storage unit items that wait a new home. Your story is inspiring. My dear friend and husbands first wife has a small ranch and she once said it is her gym and her therapist. It is healing to achieve goals, sustain your own living, and healthy to keep physically active. YOu have a new tribe here to work with you. It is amazing when women come together what they can achieve. Thank you for the future advise I will need. I to have not responded to a post, but your post and the comments really rang with me this evening. I need to stay encouraged and not run and buy a townhouse. I work full time as an RN and my husband builds steel buildings. We will both work and run the homestead until I can retire at age 60. He works double time every minute he is home. We both have experienced some Farming as children and loved the life. I hope to build a great little place for our children and grandchildren to experience some of the memories I have. One of 4 still at home, but only part time with us. Out of curiosity, what do people do when a vacation is needed? I love to travel and though not gone much, I wonder what you do for animal and farm care? Kudos to all of you here. Envy is not good, but I really want what you have in a little land and love. Hi Cindi! Thank you for sharing a bit of your journey with me! I agree that women not only need each other, but can really grow in areas that only women can understand. Sounds like you’ve got a great plan laid out, I hope you’ll keep us posted as to how things progress. To answer your vacation question, I wrote a post about it here. There never seems to be a good time to leave the farm, but eventually we all have to. Take care! I feel a lot of this. I’m only 37 but I have chronic health issues and pacing is truly a thing I have to balance. We live in my partner’s family house on a quarter acre and we’re building up in preparation for having a family after doing all that early life stuff. I grew up in a rural area, whereas he always has lived here in the city. (He thinks he lived in the woods. There is an interstate across the pond and public transit available down the street! *laughs* The only bused I saw growing up were school buses!) He is 100% onboard and loves doing everything with me, however, he just doesn’t have the knowledge base to work from. He planted his own garden on the Northwest side of the house! In the shade. *shakes head* So while I’m not on my own, exactly, he is at work 8-9 hours most days and when he is home I’m currently still teaching him a lot. Plus, we’re planning ahead for kids in a couple years so I know I have to prepare for the down swing in energy and time that pregnancy and a newborn can create! Hoping to get chickens in the yard before I have a babe so we can have fresh eggs, and we can all be broody together! I really appreciate you sharing this post and I’m definitely saving your blog to come visit back regularly. Hi Summer! I’m laughing at your Northwest garden!!! I could see my husband doing the same thing! Thanks for sharing your story and for commenting. Keep us posted! Hello! What a great article. We live in 5 acres that we bought in 1999. We have learned so many ways to work hard and live it! We have raised horses, mini horses, donkeys, alpacas, guinea pigs, snakes, lizards, turtles, fainting goats, emus, chickens, guineas, sheep, cockatiels, doves, cows, pigs, quail, turkeys and dogs. Some for profit or food but all because we enjoy it! One thing we’ve learned is to enjoy what we’re raising and when it starts being just work, it’s time to give them up. Our animals deserve our time efforts and to be lovingly cared for. If our heart is waning, the care just won’t be the same. One thing I wish we could have done better is gardening. It’s super hot in the summer and we have rattlesnakes! So gardening can be super scary and if I see a rattlesnake, I will not finish the gardening. It’s just not worth it. I’d LOVE suggestions because I really love to garden!! Hi Kristy! I couldn’t agree more when you said that animals deserve our best – they feel it when we’re just not into it anymore. I can’t speak to the rattlesnake thing, but that’s scary!!!! I’ve yet to see snake #1 on my property, but the locals say that snakes won’t live near snapping turtles, which we have plenty of. They live in the creek and the pond. Any potential on your place for a small pond? Thanks for your comment!!! Hi Lynne! I finally stopped growing corn because all I’m doing is feeding deer! I might as well put butter, salt and pepper out there for them too!!! The root cellar is on the “bucket list” here as well, and I have a large mound of dirt from another project where it will go…..someday. Worst case scenerio, I could bury a trash can in that mound and use it to keep things cool. Can’t do it all! Thanks for commenting! Wow, so many strong and inspiring women! Thank you for your post and the great ideas. I am 56 and took early retirement from teaching to move 2 states away to 44 acres in the Appalachian hills two years ago. Unfortunately, I still have to work part time as a tutor and substitute teacher for a few more years, but I have big dreams of sustainability. My husband is disabled and retired Marine who can help with some projects, but is more interested in his wood working than a sustainable farm. I dream of having alpacas one day, but will need fencing and shelter for them first. I will be expanding my garden this year, but think raised beds and containers will be the way to go. Also, I’m planning to get some chickens soon! Hi Shari, Thanks for sharing your journey, 44 acres in the Appalachian hills sounds incredible! And yes, housing and fencing those critters is a whole lot harder than bringing them home! Best to you! After all that hard work getting good soil, have you thought about using that area to grow feeder corn or grains for your livestock? I homestead on 5 acres, and this year we forgoed the traditional garden for raised beds and used the remaining space of the old garden to grow and dry corn feed for winter. Stalk n all gets feed to the horses and cows and the chickens eat up what they leave on the ground. Just a thought. Thanks for the great blog! Best wishes. Hi Amber, Great suggestion!! I do plant for the chickens, but I could definitely do a better job with growing for the horses! I’m going to work on that! Hi Kelly, I have found the perfect place for encouraging the journey I find myself on. My house in Houston, Texas has flooded for the second time and I lived in my travel trailer for a year waiting for the long renovation to be finished. “Harvey” came along last year and I found myself in the same situation again. I am fortunate to have inherited 22 acres and made the decision to move out there to live. It was a process to turn pasture land into a home site but once you start doing one thing there is always something to follow. I have become a full time caretaker for my roomate who was my partner when we were Paramedics working on an ambulance together so I have no help in this endeavor. I would like to raise my own food and some farm animals if I am able. I am starting out with container gardening to try and figure out how to grow vegetables and in the meantime get some raised boxes built-up for fall. I am so happy to have found other women who are on the same path and I feel like you’re experiences can help me in so many ways. Kelly, at 70 this may seem like it is a little late in my life to start all this but the journey has begun and I am following where it takes me. Hi Carmen, I’ve read your comment several times now and I’m just heartbroken about the continued challenges from Harvey for you! On top of that, being a caretaker in any stage of life is difficult, at best. You are among friends and supporters here! I truly appreciate you sharing your story! An idea for your big garden space, have you thought of planting grains or seeds that you could then turn and feed to your animals? Jayne, Great suggestion! I’m thinking about buckwheat….thank you! Wow, ran across this and am so glad. I am trying to convince the wife this is the way to go. We can get land reasonable here in ND, or old homesteads I should say. Winters can be cold. I look forward to more from you. Hey Todd! Great to hear from you! Yep, I get those cold winters, we have them in Ohio as well, but at the end of the day, it’s still all worth it. Best to you! I love this post! My husband and I had always talked about homesteading and homeschooling. We had just bought a house and gotten our first batch of layer hens when he walked out on us. Not wanting to put my (not quite 2 year old then) daughter in daycare and give up on homeschooling, instead I set to homesteading, and making a living from our livestock. Still looking for acreage to expand, but while we look, I’m still raising layers, meat chickens, ducks, and meat rabbits in our smallish yard (our horse is boarded, look forward to bringing her home). It is already a lot of work juggling my daughter and homesteading alone, but it is so fulfilling that I can’t wait to expand. My biggest challenge is gardening! I can handle the animals fine. They have always been my strong point. But plants? Oy. Our first year here I built 3 big container gardens and pots and my herbs by the door. It was way too much for me to keep up with. This year I cut back to just a few pots, easy perennial herbs in the containers, and one container that I grow a mix of weeds in just for the chickens and bunnies. Whew! I think permaculture really is the only way to do this alone, it would be totally overwhelming otherwise! Hey Rebecca! Thanks for commenting! First, I’m sorry about your husband, that must have been very difficult. I can hear in your words that you’re very strong and I think it’s pretty cool that you’ve continued to homeschool and homestead! Take one day and one year at a time with this, calculate every step and every dollar that you spend. I totally agree with your thoughts on permaculture, I’m working on that as well, but it takes time. I wish you all the best with your endevours, Rebecca, and I hope you’ll stay in touch! Here at the Cockeyed Homestead, we are two widows creating a self sustainable homestead. Our vision, by the grace of God, is to live and work on the homestead and offer knowledge in exchange for labor to other widows. Widows come in various ages and sizes. Each invited widow is asked to bring their own solar tiny houses onto our two acre homestead (fee charged for electrical and conventional waste disposal). They will learn organic gardening, food preservation, basic building techniques, animal husbandry (chickens rabbits goats) all easily maintained and cheap to purchase, butchering, security, hunting/foraging, spinning, needle arts, and much more Hands on teaching methods with a flexible schedule. We do require that they have their own income source. Emotional support of other widows. We know what they are going through and I’m an ordained minister with grief counseling experience. A place for healing and health. Working smarter not harder is stressed. We believe in see, do, teach. We’re praying and passing it forward. Jo, that is incredible!! What a ministry! Equipping widows to take care of themselves is a fabulous pursuit, we need a whole lot more of what you do in the world! Thanks for commenting and letting us know about what you do! Hi Jenn! Wow, thanks for sharing your journey! I’ve heard before about the “hot tub” advice, I have yet to figure that one out. In the meantime, I soak in a hot bath with Epsom salts. You’re awesome, keep up the great work! It was good to read your article. I’m 67 & alone. I bought 12+ acres 5 yrs ago, though it has timber on 2 sides. I’m just in process of bldg my house. I hope to put a garden in this summer. I got 120 yds of wood chips delivered before snowfall & 1 truckload of horse manure, more to come. I like the no til idea & also the rain gutter system. I’m also a woodworker & plan to build raised planters, so I’m not bending or kneeling as much. I plan to add some ducks, couple of geese, maybe quail & 2-3 dwarf goats. Keeping in mind my winter months for their care. I may try a field of flowers to sell. Although my goal was to have garden to table events, that will depend on how much of a green thumb I have. First is the garden & ducks, see how that works, then add or not next year. I only have a small SSI, so I need to make only a little more, plus whatever it costs for the animals to be comfortable. I’ll have no mortgage. My electric, propane & car insurance are my monthly bills. I figure winter months are for my woodworking & any crafting to sell. Hopefully it will happen with some success, I love my land & the peace & quiet. I have a flowhive & will see if I want more hives later. First to plant flowers for them, butterflies, birds & myself. The green trees need some color. Build a shelter for the bees for winter. I’ve been living in a trailer on the property for 2 yrs now, which has given me time to do alot of research & listening to you tube from homesteaders. Taking it slow, but still planning. Hey Jan, that’s one awesome setup! You go girl!